What took six games and 10 days to build up, came crashing down in the span of two 60-minute segments in less than 48 hours. The surprising USA men's hockey team were on the cusp of medaling for the first time since striking Gold with a memorable performance on home soil at Lake Placid in 1980, but in Albertville 12 years later, the Red, White and Blue couldn't get over the hump against a pair of nemeses from behind the former Iron Curtain. In the semifinals, it was a 5-2 defeat to the so-called "Unified Team," a mish-mash of "amateurs" who would have competed under the Soviet banner if it hadn't been for the slow process of Communism's fall leading to the inevitable breakaway and independence of its satellite nations. Within two years, 18 members of that team would see action in the NHL -- many of those jumping right into the league after leaving the French Alps. The bronze-medal game wasn't even close. A pre-Velvet Revolution Czechoslovakia team -- which, ironically, only featured four soon-to-be-NHLers -- whipped the Americans by a 6-1 count. It prevented our boys from medaling on foreign soil for the first time since winning Silver in Sapporo in 1972, a dubious honor which still stands as the 2014 roster prepares to compete in Sochi. Still, for almost two weeks, it was a glorious ride put together by an unlikely squad built from the U.S. college game and some choice NHL talent not under contract. 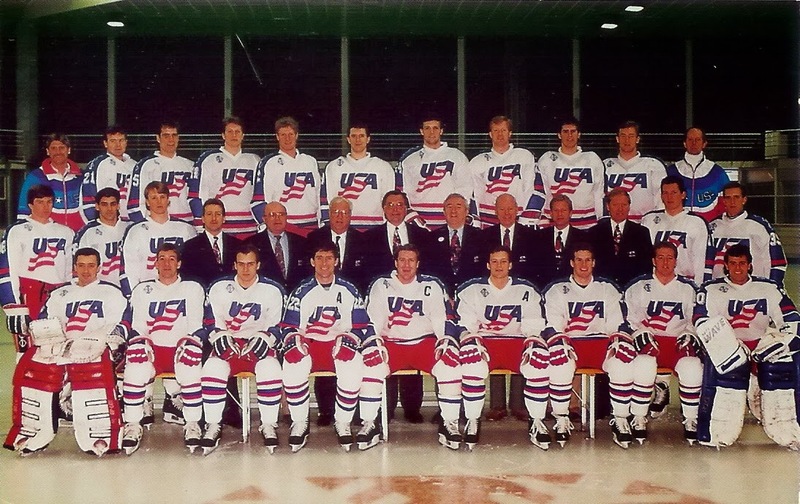 Led by Dave Peterson, Team USA was placed in Group A for the 1992 Winter Games in Southeastern France. Its record against NHL, college and other national teams in the season's worth of exhibitions was 17-31-8, and Peterson drew fire for the seemingly endless parade of players and roster combinations leading up to the tournament, that little was expected. "The big trick is to get into the village healthy and well, and the peaking takes cares of itself," Peterson said in defiance of expectations. "I like this team." It looked to be a cakewalk, even for a team which was trying to elevate itself from a seventh-place finish in Calgary four years prior -- and it was. The only threat, besides themselves, to reaching the medal round was Sweden, the Bronze winners in 1980, 1984 and '88. Finland, Italy, Germany and Poland rounded out the group, and the USA got right to work. Game 1 kicked off on February 9 against the Italians. Under new rules created to aid lesser-qualified nations against the traditional powers, if a player or his spouse had any type of ancestry from a certain country, he would be eligible to play. That's how Bill Stewart, Bob Manno and Frank Nigro, all born in Canada but having Italian blood course through their veins, ended up playing for that squad and former Penguins head man Gene Ubriaco ended up behind the bench. It didn't help, though, as America scored four straight times in the third period after trailing 3-2 and triumphed by a 6-3 count, led by Tim Sweeney's goal and two assists. "I told them to put a smile on your face. We have 20 minutes to get one. When we get one, we'll get the next one. Let's win the game and have some fun with it," Peterson said to his charges who faced that deficit after blowing a 2-0 lead. Ray LeBlanc then posted his first shutout of the tourney, blanking Germany thanks to 46 saves in a 2-0 decision two days later. That 2-0 start equaled the best for the Stars and Stripes in pool play since 1960 in Squaw Valley. The Finns were next, boasting a certain current Anaheim Duck on his professional farewell tour, but fell victim to the USA, 4-1. Former Pittsburgh Penguin Scott Young stoked the offense with a pair of goals and LeBlanc made 29 more stops as the USA reached the medal round for the first time since 1980. "Everybody on the team is excited with what's going on, but we also have to take things in perspective," said Young, who played on the doomed '88 squad. "No matter if we're first, second or third, we could still be eliminated in the first game of the medal round because of the new (single-elimination) format, so we can't get too high." LeBlanc worked his magic once more in a 3-0 whitewash of Poland, but the Swedes rallied to post a 3-3 tie in the final contest of Pool play. That undesirable result was made all the more bitter when ex-NHLer Mats Naslund put defenseman Greg Brown out of the game with a questionable check. It resulted in Peterson failing to meet his counterpart for the postgame handshake, yet only prevented a clean sweep for Peterson's charges. Team USA finished atop Group A with a 4-0-1 mark, tying Sweden and Finland for the highest goal differential at plus-11. They did, however, allow the fewest goals in preliminary round play of all nations with seven. That was a dagger to the hearts of critics who panned Peterson's run-and-gun style that created defensive issues in Calgary. Host nation France, which boasted such luminaries as Patrick Dunn and Yuha Ylonen due to the lax membership restrictions, was next up in the quarterfinal round. In the crossovers, the first-place Americans were paired with the fourth-seeded French and the USA kept rolling with a 4-1 victory. Up next, was a date with a old foe, a wolf in sheep's clothing. "People who have never seen a hockey game remember 1980," USA forward and team captain Clark Donatelli said to the Baltimore Sun. "We have to live with that. Everyone always remembers that gold medal. Now, we want to win a gold medal. And if we do win it, it will be just as great a miracle." By the end of a 5-2 defeat against the erstwhile Soviets, it would have been a miracle for the Americans to stop complaining. Gold medal hopes dashed by falling back on the old crutch of crying conspiracy. "The team worked awful hard all year, and it's a shame to let an official take it away in the third period. I don't know who's in charge of picking the refs, and I don't know how they can let this happen," groused Donatelli. "Five penalties in the third period. You can't come back from that. The NHL All-Stars couldn't do it. The Swedes got us. Their hockey team couldn't beat us, but their ref surely did." Sven Erik Sold was fingered as the main culprit which turned a 2-2 game in which the Americans admittedly were scuffling, into a runaway for the other side. The only truths that can be proven was that the Unified Team claimed a 55-18 shot edge, five straight penalties were called against the USA and that Andrei Khomutov, Yuri Khmylev and Evgeni Davydov beat LeBlanc to salt away the victory. "I think the American players were tired," said Vyacheslav Bykov to the LA Times. "That's why they were holding and hooking, because of fatigue. We were never worried when it was 2-2. We controlled the play." The Unified team then went on to beat Canada, featuring an 18-year-old Eric Lindros, to win their final Gold to date. Everything exploded against the Czechs. America's stout defense gave up 47 shots and six goals, looking like lost children playing pond hockey against their savvy opponents who plied their trade on the Olympic sized (200x100) ice sheet. It was a shooting gallery from the start, as LeBlanc had to contend with 24 first-period shots, only letting chances from Frantisek Prochazka and Tomas Jelinek through. Kamil Kastak put his nation up 3-0 early in the second and LeBlanc finally earned a seat on the bench when Jelinek connected for his second of the night with 2:38 gone in the third. Ted Drury provided the only answer for the USA at 6:55, beating Petr Briza on a slow shot, but Scott Gordon was victimized twice in a span of 2:11 later in the frame on soon-to-be NHLer Robert Lang, who provided the five-goal margin. "That early lead they got shook us up," forward Joe Sacco said. "We thought if we got one early in the second, we could come back. But we can't complain. The Czechoslovakians capitalized on their opportunities. We really expected to win the bronze tonight. Everybody thought we would. We didn't come out with a medal, but fourth place is not bad. Once we get over our sadness, I think we'll all realize that." Response to the unexpected fourth-place finish was immediate. LeBlanc, the standout star for the Americans, earned a call-up to the Blackhawks. He won his only NHL start, stopping 21 shots as Chicago beat expansion San Jose, 5-1, on March 10. By the end of the 1991-92 season, Mantha was back in the NHL thanks to a five-game stint with the Philadelphia Flyers, while Bret Hedican (Blues), Scott Lachance (Islanders), Ted Donato (Bruins), Steve Heinze (Bruins), Shawn McEachern (Penguins), Marty McInnis (Islanders), Sacco (Maple Leafs), Tim Sweeney (Flames), Keith Tkachuk (Jets) found places in the Show. Scott Young returned to the NHL the following season with the rejuvenated Quebec Nordiques. America has seen a mixed bag abroad since then. Its last team without the benefit of professionals, two years later at Lillehammer, did a lot of tying and losing en route to eighth place. In '98 at Nagano, they broke chairs instead of records and finished fifth, one slot below Canada. Torino saw perhaps the weakest batch of pros to wear the tricolors, who slid all the way back down to eighth. The 2014 squad has a lot of wiggle room between a Silver in Vancouver and the depths of Northern Italy.